Disclaimer: Views in this post are my own and does not represent the views of the FDA. As a Special Government Employee (SGE) for the FDA, I served as Consumer Representative for this hearing. 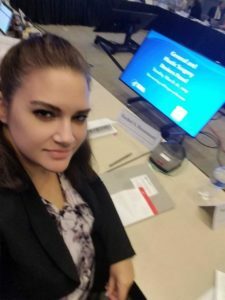 This blog post is my perspective as the Consumer Representative on the panel. Advisory panels typically have 20 members, made up of FDA staff, physicians, an industry representative, a consumer representative, and a patient representative. 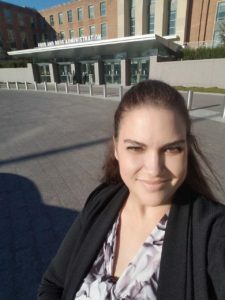 My role as Consumer Representative at the FDA is to analyze scientific data, represent the best interests of consumers, and make recommendations to the FDA about changes that should be implemented. 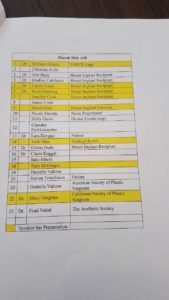 The list of speakers has 81 names on it. Over 2 days, it was 4 hours of testimony from breast implant victims, survivors, surgeons, and public health organizations. 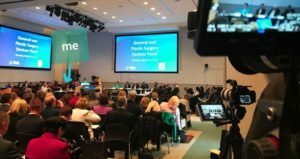 That so many people traveled to Silver Spring, Maryland for this hearing on their own dime to speak about the harm of breast implants is very telling. 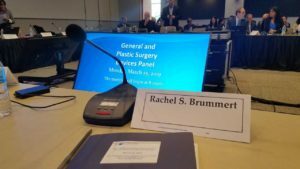 At the two-day hearing, there were presentations from patients, the FDA, and device makers Allergan, Mentor, Sientra, and Ideal. As Consumer Representative, I can ask questions to the FDA and to the device makers. 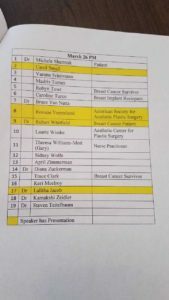 The panel Chairman did not call on me or the Patient Representative when we wanted to ask questions. 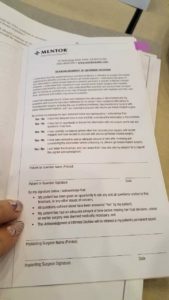 During the break, we asked to speak with him privately and told him it is not acceptable to ignore the representatives if we had questions or comments. He apologized and did call on us when we raised our hands after that. One of the issues I raised after analyzing the data on textured implants causing lymphoma was that textured implants should be removed from the market. Over 30 other countries have removed them from the market due to the risks, yet the United States has not taken any such action. Some panel members took issue with my comment about removing it from the market, stating that “we should not be making knee jerk decisions like that”. I disagree. The science is there. The link between textured implants and Breast Implant Associated Anaplastic Large Cell Lymphoma (BIA-ALCL) is obvious. There’s nothing “knee jerk” about it. Let me clear about something: BIA-ALCL is NOT breast cancer. It is a man-made cancer specific to textured gel breast implants. So women who survive breast cancer and opts for breast reconstruction is potentially signing up for yet another cancer. Let that sink in. BIA-ALCL is often called “rare”. It’s not rare. It’s that it isn’t clearly understood, the surveys used to track data are long, patients are suddenly dropped from studies, and patients are often not informed properly. The panel also discussed adverse event registries. While I think they’re a good idea, there are too many. It makes it confusing, there are different parameters for each one, and they are exclusionary. Current registries contain information for new surgeries and re-operations. That excludes a large population of women who are in limbo because they can’t afford explants, and if information is excluded, you’re not getting accurate data. They are based on voluntary reporting, and not on medical records. In addition, Breast Implant Illness (BII) is not included in registries so the data is incomplete. My recommendation to the panel was to have a centralized registry that anyone can have access to. Current registries do not make data available to patients. It does a disservice to patients when information that should be transparent is withheld; otherwise, there is no informed consent. I also recommended that registries include Breast Implant Illness. I also feel that registries should be linked with electronic health records. The current system is based on diagnosis, not on the complete picture of symptoms. The device makers claim that they provide information and checklists. 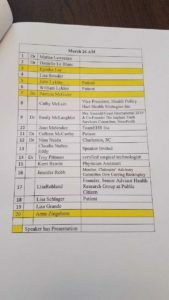 However, patients are not getting that information – a point made by almost all of the speakers. 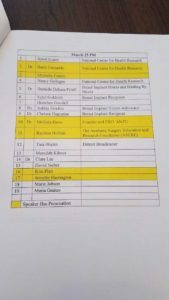 When the issue was raised during panel deliberations, Mentor later provided a booklet with two pages bookmarked. Not everyone on the panel got the booklets so some of us had to share. This made me uneasy so I snapped photos of the booklet and the bookmarked pages. My instincts were right. I got to look at it but the Industry Representative held on to it. It’s a 70+ page booklet with a checklist that is insufficient. 70+ pages is a lot to read, information is buried, and most concerning is the fact that patients never see it. 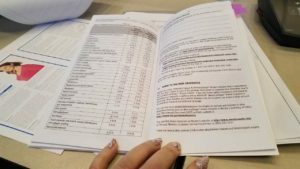 The booklets are given to physicians, not patients. After seeing this, I made the recommendation to the FDA that the FDA, device makers, and patients have an equal seat at the table to devise a checklist that is succinct, clear, transparent, and to make it mandatory that patients and the physician sign off on each checklist point. 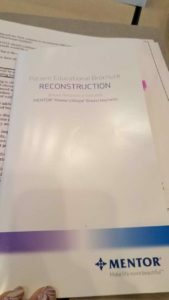 These materials also need to be made available at a consultation prior to surgery, not on the way to the operating room. I asked a Mentor representative for her business card after she said she was willing to have such a meeting. If they don’t keep to their word, they need to be held accountable, and the FDA needs to be held accountable if they don’t implement this recommendation. If patient safety is truly the priority they say it is, true transparency and equal seating at the table needs to happen. The FDA has hidden hundreds of thousands of incident reports regarding breast implants. An investigation by International Consortium of Investigative Journalists revealed that the FDA has allowed device manufacturers to bury adverse event reports using a program called “alternative summary reporting”. 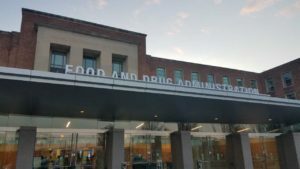 Two days later, FDA Commissioner Scott Gottlieb announced that the FDA will release old data, stating that full disclosure is a priority. 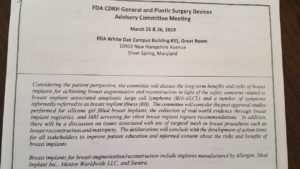 Shortly before the hearing, the FDA sent warning letters to Mentor and Sientra- breast implant manufacturers stating non compliance with post market surveillance. My question is this: After the FDA sends warning letters, have they ever recalled a device? To date, the answer is a resounding no. That needs to change. Also of note, ingredient lists for breast implants are not made public. Think about that. The food you eat, the beverages you drink, the supplements you take… they all have ingredient lists. A consumer can decide whether they want to consume those products because the ingredients are available. This is not the case with medical devices. Breast implants are causing autoimmune and other breast implant illness symptoms. If a consumer knew what was in the implant, you add another layer of informed consent. These implants contain heavy metals, neurotoxins, carcinogens, and other harmful ingredients. Wouldn’t you want to know that? In addition, knowing what is in the implants can help during the screening process (which is also lacking). There is none prior to implant. Post-implant surveillance is lacking. The panel deliberated on the use of MRI screening 3 years after implant and every 2 years after that. MRIs are expensive and not covered by insurance. The patients who suffer with Breast Implant Illness all stated that their symptoms disappeared after explant. Explant surgeries are not covered by insurance. By mandating pathology after implants, insurance would cover it. The FDA wants to eliminate MRIs as post-implant surveillance because of non compliance from patients. If MRIs were covered by insurance and were not so expensive, there would be more compliance. Alternatives were discussed during the panel deliberations. One was mammograms. I had to make sure I heard that correctly because I couldn’t believe this was even being suggested. If you’re a woman who has had a mammogram, you know how it feels to have them. Now imagine having breast implants which are prone to rupture. Squishing breasts in that torturous contraption only puts women at more risk of rupture. Mammograms to test for ruptures are the very thing that could rupture them. And these were suggested by physicians. I’m no doctor but it’s one of the most ridiculous suggestions I’ve ever heard. Ultrasounds could be a feasible option, but again, if MRIs were covered, we wouldn’t really need to have that conversation. Deliberations also brought up the use of surgical mesh for implant surgery. 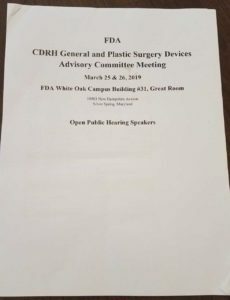 In February 2019, the FDA held a hearing on the use of mesh, at which dozens of patients came forward with their stories of harm. Mesh for breast implant surgery is mostly for aesthetic purposes, and patients are not told that surgical mesh will be used during their surgery. Considering how harmful surgical mesh is, you’re adding insult to injury since both mesh and breast implants are causing enormous harm. Mesh and breast implants are classified as a Class III medical devices. Class III are considered high risk devices. They must be life-saving or life-sustaining and include devices such as artificial heart pacemakers. Any device in this category requires only one clinical trial as part of the pre-market approval process. The testing must provide evidence that the device is reasonably safe and effective. Mesh and breast implants should not be Class III devices, and need to be reclassified as Class II. And as a side note, if you are harmed by a Class III device, you cannot hold the manufacturer accountable. The FDA has the authority and responsibility to protect patients. I call on them to take patient testimony to heart and implement the patient safety recommendations that I, and others on the panel, brought up. The women who have implants deserve better. For more information about how screwed up the system is for medical implants, watch The Bleeding Edge on Netflix. Thank you Rachel. Great job summarizing the issues and speaking up at the meeting. I appreciate your input. We appreciate what you are doing and this is an excellent summary. The investigations from the 1990-early 2000 against Mentor should be followed up on, in my opinion. In addition the FDA officials that made statements proving the FDA was not taking action back then and still has not, should be noted. Saline was never subjected to official studies, since many doctors believe saline is sterile water. Saline is no longer sterile after it reaches 77 degrees temperatures after 14 days. In addition, the manufacturer faulty valve and patches allow the implant to leak a little and allows reverse flow. This means auto inflation of body fluids which allow bacteria and fungus to grow as the implant now acts as an incubator. Scientist warned the FDA in 2000 to NOT approve Saline implants, but the FDA ignored the information from experts. All implants removed should have fluid & capsules tested and the implant shell of both saline and silicone examined for leaks and leaching. I again want to thank you for all you are doing to assist in making changes. Sincere thanks for this. It is a great summary that is brief enough for BII sufferers to share with our loved ones. Rachel, I was diagnosed with BIA ALCL and spoke at hearing. I am so impressed with your understanding of the issues and ability to clearly set forth what needs to happen to protect the health of breast implant recipients (past and future). I submitted my ideas for what should be in an informed consent regarding BIA ALCL to Mr. Garcia. I hope Mentor is true to their word and welcomes patient input regarding informed consent and that the FDA mandates a checklist. In the past 3 years I’ve learned that that is a typical response from surgeons. Something is very wrong with this system! Manufacturers need to be held accountable, but also Plastic Surgeons need to be informed! Thank you, Rachel Brummert, for performing as a true Consumer Representative. The criteria the FDA uses to select the Consumer Representative rarely conforms to what a consumer would consider a representative. You listen to the consumers and also communicate back to consumers about the issues and decisions by the panel. This is essential. Thank you for setting the standard that should have been practiced by the FDA/CDRH. It could have PREVENTED substantial harm to thousands of women globally and their families. Rachel-thank you -this is a wonderful summary. I had breast cancer is 2015 and reconstruction same year. I was diagnosed with BIA ALCL 2 years later in 2017. I attended the meeting in Silver Springs but did not speak. I am hoping that this starts to bring awareness we deserve and some changes are made to the classification of breast implants. Life saving Class III device-no -but definitely life altering.